Respected writer and lecturer on all aspects of inspired and inspirational leadership, John C. Maxwell - with Jim Dornan, prove that the most effective way to make an impact for good on your church, family, community and workplace is to make an impact for good in the lives of individual people. In 'How to Influence People', two of the most effective leaders in church and commerce show you how to make a positive impact on every person in your life; from your children and congregation to your co-workers and customers - and even the checkout staff in your local supermarket! The book gives you the techniques and motivation you’re missing to become a strong and positive influence in the lives of those around you – and without resorting to position, power and pressure. By “pouring your life into other people,” says Maxwell, “you can truly make a difference in their lives.” And when you make a difference in the lives of others, it makes a difference in your life too. John teaches you how to identify the key stages of influence in your relationships and to skilfully find your way from perfect stranger through helpful confidant, on to inspiring mentor and finally to maker of yet more active influencers for good. The book isn’t just for church leaders who want to reach more people, it’s for managers who want to see their employees respond with new enthusiasm, sports leaders who want to see players perform to their highest potential and parents who want to connect with their children on a deeper level. If you desire to grow your church, build a business, strengthen your children, or reach the world, you need to influence in the lives of others. 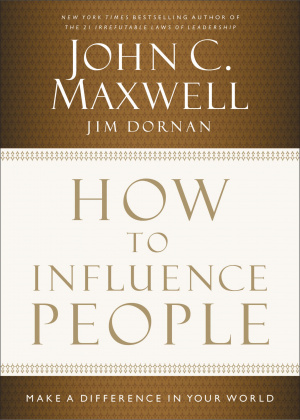 How To Influence People by Jim Dornan; John C Maxwell was published by Thomas Nelson in March 2013 and is our 23047th best seller. The ISBN for How To Influence People is 9781400204748. Be the first to review How To Influence People! Got a question? No problem! Just click here to ask us about How To Influence People. You can make a difference! Believe it or not, the most effective way to make an impact on the world is to make an impact on individual people. How do you do that? Through influence. In How to Influence People, leadership guru John C. Maxwell and his friend Jim Dornan tell you how to make a positive impact on every person in your life, from your children and coworkers to your customers and the barista at the coffee shop. How to Influence People will empower you to become a potent and positive influence in the lives of those around you without using a position or title. By pouring your life into other people (Dr. Maxwells definition of mentoring), you can truly make a difference in their lives. And when you make a difference in the lives of others, it makes a difference in your life too. Learn to perceive the stages of influence in your relationships and skillfully navigate your progress from perfect stranger to helpful confidant, to inspiring mentor and multiplier of influencers. John C. Maxwell is an internationally respected leadership expert, speaker, and author who has sold more than 19 million books. He is the founder of EQUIP, a non-profit organization that has trained more than 5 million leaders in 126 countries. Jim Dornan was educated at Purdue University in aeronautical engineering. He has successfully made the transition from aerospace to the world of global marketing and is president and owner of Network TwentyOne International. He is also co-founder, along with John Maxwell, of the non-profit EQUIP Foundation. Let this book impact your relationships, great and small, and make you a positive influencer and better leader in the lives of those around you. One of the world’s top experts on leadership in church and business, and founder of the INJOY Group dedicated to helping people maximize their personal and leadership potential, John C Maxwell appears in front of more than 250,000 people and is read or watched by more than a million more. He says that, for himself, the big moment came In the early ’70s when as a 24-year-old pastor, he realised that simply working hard doesn’t guarantee success. Often looked to as an experienced leadership coach, he sought help from an executive coach himself when offered the chance to lead one of the biggest churches in his denomination. John didn’t feel experienced enough for the job, but the coach asked him about the job, he asked about John’s plan for own personal growth. “I had no plan,” says Maxwell. That’s why one of John’s big things is “Intentionality” – the concept that if you want your life to improve, you must improve yourself first. John Maxwell appreciates that everyone has the potential to improve themselves, and that requires ‘intentionality’ a concept many other leaders and leadership teachers are switching on to. The strategy of ‘work hard’ isn’t enough. And hoping for the desired outcome isn’t a strategy either. Getting started brings its own problems, no the least of which is setting priorities. Keeping with what that first coach said to him, John feels it’s important to schedule a daily, 60 minute meeting with yourself for think about your own personal growth. It’s vital to prepare yourself or give up any hope of reaching your potential. Maxwell wants to encourage people to seek out what you were put on this earth to do. Then pursue it with all their energy. To find that, you have to be curious about yourself . The greatest difference between curious, growing people and those who aren’t is the belief that they can learn, grow, and change. To be truly ‘intentional’ you have to go looking for growth, knowledge, understanding, and wisdom – because it will not come looking for you.